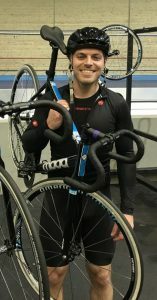 Ahead of his “Cycle Across Switzerland 2019” challenge starting on 19th April 2019, Woodfines’ Marketing Manager, Nicola O’Loughlin, speaks to Crime and Regulatory Solicitor, Nathan Taylor-Allkins, about his upcoming adventure and fundraising for the Baby Bereavement Fund at Milton Keynes Hospital. How did the cycle challenge come about? How did you choose which charity to raise money for? “I wanted to choose a charity close to my heart and to use as an added incentive to keep me pedalling when my legs are screaming for me to stop. I decided to raise money for the Baby Bereavement Fund of Milton Keynes Hospital Charity as my sister-in-law and her partner suffered the devastation of losing their daughter at the very final stages of their pregnancy last year. “I wanted to raise £880 for the 880km we will be riding. I am delighted to say that thanks to the amazing generosity of local businesses, colleagues, family and friends that the total has already exceeded £1,500. I am really grateful as the money will make such a difference and will allow the Charity to continue to offer the wonderful services it does for free and to help those going through some of the worst times in their lives. “Across all of our office, the staff at Woodfines are always so supportive of charitable causes and the Milton Keynes office is holding a bake sale on 11 April 2019 with all the proceeds going towards the fundraising total. My wife has also very kindly prepared a fantastic Easter hamper which is also being raffled off and which has already raised over £200 in raffle tickets! To find out more about Nathan’s progress, and the cycle itself, please visit his JustGiving page.